Last month saw me going a little giddy over Sapphire’s take on AMD’s new, slightly cut down Tahiti LE GPU. It was an incredibly pacey card, for just under £200, and offered the sort of performance that you’d struggle to hit with a £300 card. And now I’ve got the jokerCard version of this great card from Club3D. Somehow you can pick up the Club3D version for an insanely low £172. The distributors are selling the cards into retail for only a little less than that, so anyone dishing them out at that price is barely making anything on them. To be honest though, I couldn’t care less about their profit. What I do care about is the fact that you can now pick up a graphics card that will give you next-generation graphical fidelity right now for an incredible price. Not only is this card capable of throwing around polygons at a rate of knots at the standard HD resolution of 1,920 x 1,080, it’s more than happy doing the same at the rarefied heights of 2,560 x 1,600 monitors. And that’s without dropping image quality or post-processing effects such as anti-aliasing from the menu either. 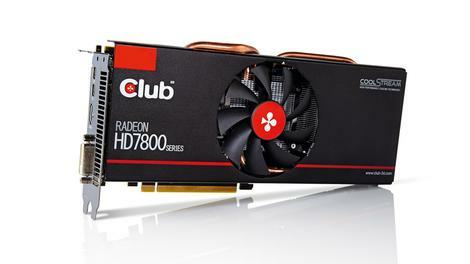 No sacrifices have been made with the Club3D jokerCard compared with the original Sapphire HD 7870 XT. For the record, that means it’s got the same Tahiti LE GPU, replete with 1,536 shader cores and 4.3 billion transistors at its heart. The only thing that’s changed is the third-party cooling array that adorns the Club3D jokerCard. It’s got a single mid-PCB mounted fan, but with some rather fat copper heatpipes running through the large heatsink. While the Sapphire card had its familiar dual-fan setup, this Club3D card still let me hit the same 1,200MHz overclocking mark even with the single-fan array. It was running rather hot though, so I’m not convinced that it would be able to run at that speed all day, whereas the Sapphire card was completely stable at that pace. Whatever the vagaries of GPU overclocking afford you, and whether you even bother to start cooking your clocks at all, the HD 7870 XT is a marvellous graphics card, and the Club3D jokerCard is a great version of it. The pricier Sapphire card may have the edge on top-end cooling, but unless you’re seriously going to be ragging your GPU on the highest overclock you can muster from it, the Club3D cooling array is going to be more than capable. It’s almost unbelievable that you can now pick up a graphics card that’s almost half the price of an overclocked GTX 670, but which will post incredibly competitive benchmark numbers against it. You may struggle to find the Club3D card for this price – it’s surely going to be in high demand – but we found it at this price from Amazon direct, and it ought to keep a decent stock level. Especially if they keep selling.